The FAB X Forever Active Boost ™ nutritional supplement includes vitamins, amino acids and electrolytes, no calories, sugar or carbohydrates. Would you like to have more time to be active all day? Your time is the most valuable resource, and having enough energy for the whole day is essential to achieve your goals. We have designed FAB X to help you on the day to day taking care of your health and ideal to combine with physical exercise, while you enjoy the same benefits and deliciousness, characteristic of FLP products. 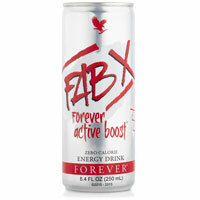 Contains Guarana, with natural caffeine, which contributes to the immediate energetic effect of FAB X, while the ADX7 technology - a patented formula of adaptogenic herbs, vitamins, amino acids & electrolytes - created by a leading scientist and sports specialist, provides you with the energy to long term without bringing you calories.